Small animals like squirrels, raccoons, and other rodents can seem rather harmless. Sure, they might break into your garbage bin and scatter your trash across the yard, but beyond that, they rarely seem to do much damage, right? Not entirely. Rodents can actually cause significant damage to your home. And as winter approaches and these animals start to look for a safe, secure, and warm place to pass the cold days, your attic and home become especially vulnerable—and the only thing standing between them and their goal is your roof. In today’s blog, the expert roofers at Tim Leeper Roofing would like to share with you some information regarding animals and your roof. As Nashville’s top roofing contractors, we want to do all we can to keep your commercial and residential roofs clean, safe, and functioning properly. Whether you need a roof inspection or total roof replacement, don’t hesitate to contact us! 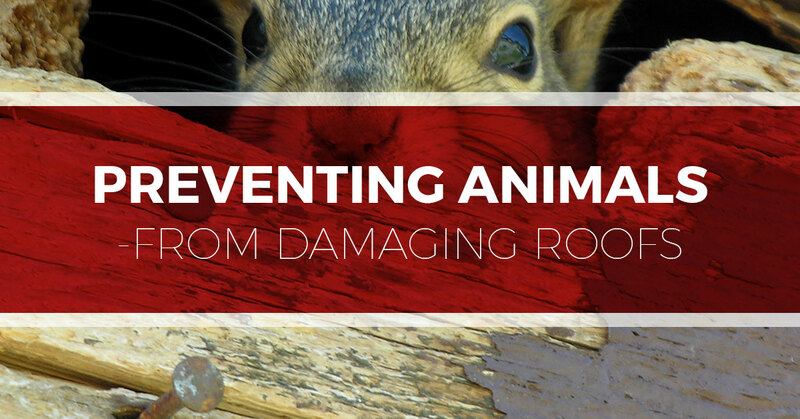 Read on to learn about some of the steps you can take to keep animals away and prevent them from damaging your roof. There are a number of potential havoc-wreakers outside your home. Mice, squirrels, raccoons, bats, birds, possums are all capable of trying to gain access into your abode or take up residence in your attic, gutters, or chimney. Broken Shingles – Shingles that are already weak or rotting are extremely vulnerable to an intruding animal. And when the cold of winter is near, animals will do anything to enter your home, including digging at these weak spots. Torn Soffits – The soffit is the covering that bridges the area between your siding and roofline. For many animals, this is the first target—once they tear through they have a nice warm, place to stay. Leaks – Naturally, once an animal creates a hole in your residential or commercial roof, this will allow a route for water to enter. When water enters, it leads to damaged roofing materials, ceilings, and could even damage the contents of your attic. Holes – Although metal roofs are typically impervious to animals that drill holes, roofs covered with asphalt shingles are susceptible to woodpeckers and similar animals. Compromised Roof Sheathing – The sheathing is the flat panel that sit at the base of your roof and to which your shingles are attached. It helps keep the roof trusses or rafters in place and properly spaced. If an animal damages the integrity of your shingles, the sheathing can then become exposed to water and, therefore, quickly become damaged. Damaged Features – In an effort to gain access to the attic, animals have been known to chew through roof ridge caps. Similarly, when they set up home in gutters, vents, and chimneys, they can also harm these respective features. Keep Gutters Clean – Not only will gutters that are clogged with dirt and debris not function properly, but they will also attract unwanted visitors, like birds who will happily use all the debris to build a cozy nest. Trim Trees – Tree branches that are hanging above or near your roof give animals easy access to your roof. Keeping branches trimmed will help destroy this bridge, keep gutters clean, and keep your roof in better condition and not as exposed to falling limbs. Eliminate Food Sources – If animals find a regular food source outside your home—like pet food or an open garbage bin—this will increase the chances of them trying to invade your roof in search of more easy food. Add Chimney Cap – Open chimneys are an open invitation to animals looking for shelter. Placing a chimney cap on your chimney will deny them access. Check Attic – Check your attic regularly for animal intruders. If you find a pest, this will verify a vulnerability in your roof or attic area and confirm that your roof needs a thorough inspection. Roof Maintenance – Keeping your roof well maintained is essential to keeping out pesky animals. By periodically inspecting for leaks, damaged shingles, torn roofing, and other kinds of damage, you ensure that animals don’t have easy access into your home. If you decide to carry out your own roof maintenance, remember to keep these tips in mind. And if you feel uncomfortable or unconfident performing your own roof inspection, don’t hesitate to contact your local roofer. If your roof has any damaged areas, these vulnerable points may be targeted by pests. When this happens, they can cause significant damage to your roof—the type of damage that will become magnified with winter’s arrival. Following the above tips can help keep your roof in good condition and keep animals out of your attic and home. If you need help with your roof maintenance or inspection, Tim Leeper Roofing would love to help. From commercial roof replacements to residential roof repair, we can handle nearly all of your roofing needs. Contact us today for more information or for your speedy fast quote!